No more squinting to read the text, the text is much bigger than the other VNs I’ve converted =) I guess the font size for the other games could have been changed in the script, but then I’m not sure if everything would fit inside the screen…. But as you can see, the spacing between the words is screwed up atm, I’ll look more into it later. The menu loads fine, and I select chapter 1. I see a series of explanation screens, and finally i see a background and an old guy come up. But before a single line of text was displayed, it crashed 😦 I guess I’ll try to figure out what the problem is later… It’s probably something in the script…. Would it be possible to give me a guide of how to convert it? 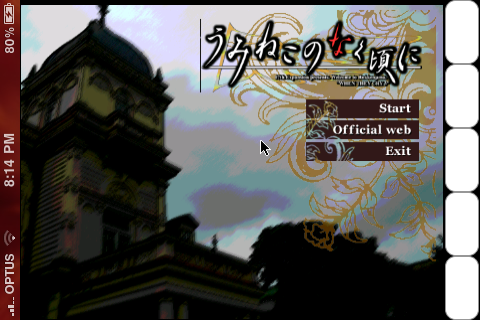 Okay i got it and its converted, but i tried Umineko Chiru. After the first few seconds it normaly comes the laught of Beatrice but exactly in this minute onscripter goes down. Does anyone one how to fix it? It shows the first sentence and the music is played but only the sound is left. this “*” is called in every line and changes the original text so that it sometimes end without spaces. currently i have no clue about how it changes the savefiles or something like this. I’m sorry, but I don’t understand — how do you download the “Umineko” file? Thanks for updating this, though! You mean the mentioned scriptcode from me? Attend that playing umineko is hard work, probably caused by Witch Hunt itselft, which i think can’t really deal with the onscripter syntax. You’ll have to edit all Red Truths and Blue Truths also the slow down, new line and the clear text “functions” of the onscripter script. This is because they formatted their script on Mac and Windows is fortunatelly ignoring it. you’ll need http://nscripter.insani.org/downloads/nsdec.zip to convert the nscript.dat in the patch folder of Witch Hunt. After that you’ll get a result.txt which essentially contains the translated script. Now you can just rename it to “0.txt” and move this file to the main folder. 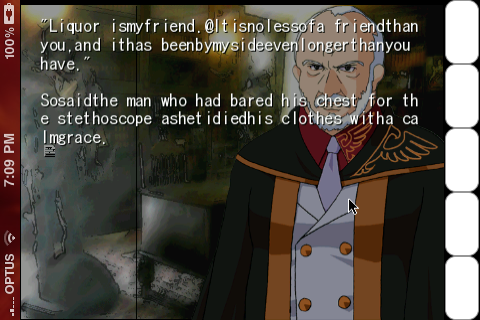 But you also need the translated images of witch hunt, for this you have to rename the “arc.nsa” in the mainfolder of Umineko to “arc1.nsa”. And and move the “arc.nsa” from the Witch Hunt folder to the mainfolder. Do the same with default.ttf. After this and the edit of my post before you should be able to play. Nice find. Too much trouble though. I think the best way to get everything to work would be to try and compile onscripter-en for iphone. I’ve been very busy lately and I’ll attempt this as soon as i get some free time. hmm i think onscripter-en already work, the only problem is reading the script in a right way. I started to correct some of the lines and after this everything went fine. If i would have same free time i could possible rewrite the script with a simple php script. I know it isnt really normal to do it in php but it will work, for example i already correted the new line and the clear text events. I just have to find all error patters and correct them in the right way. The second problem would be the save system. The problem is i think that onscripter-en for windows must be started with applocale which isnt the case for the iphone. But it will work for the music files and so on, but Umineko has a pretext function, which will be called everytime a text will printed out. This function possibly only work for 1 byte character(japanese). I fixed this problem temporary by deleting the call and autosaving on the first slot everytime a clear text event is called. So only the last shown text will be lost by loading and you cant really save manually and going in the start menu if you start the app, which isnt really a problem, because you can go back to the title after this. The one I compiled is the unmodified japanese onscripter (with support for 1 byte chars defined at compile time). Hopefully I’ll be able to whip up a quick program to modify everything in the script (probably easier than trying to compile onscripter-en anyway). Yeah i dont have any time left today, but i tomorrow i will write down a list for you. Maybe you can tell me how far you are in Umineko. because the colored fonts and so on. You possibly need regular expression, which i can use in php. Maybe you we can chat tomorrow with msn or skype, but i dont know you timezone^^ In my timezone gmt + 1 its 22:51. If you dont want to share you data on this blog you can do it per email(my email is saved here). If you have time, download http://nscripter.insani.org/downloads/nsdec.zip and you can compare the nscript.dat of Umineko and Tsukihime you will see that Tsukihime is perfectly sorted and Umineko not really xD. to its red color, if this problem is solved we should have the whole problem more than half done. Hmm, I will take a look, but I wanted to compile onscripter-en (different from onscripter, it is a fork), which supports english better and is what is used in Witch Hunt’s translations. And the a link to your used sources would be nice, too. So is there anyway to get this working, either by onscipter-en or just screwing with the files? Also I don’t really get how to compile or use the onscripter(s?) linked. I realize this thread seems dead but I kinda wanna try this thing.